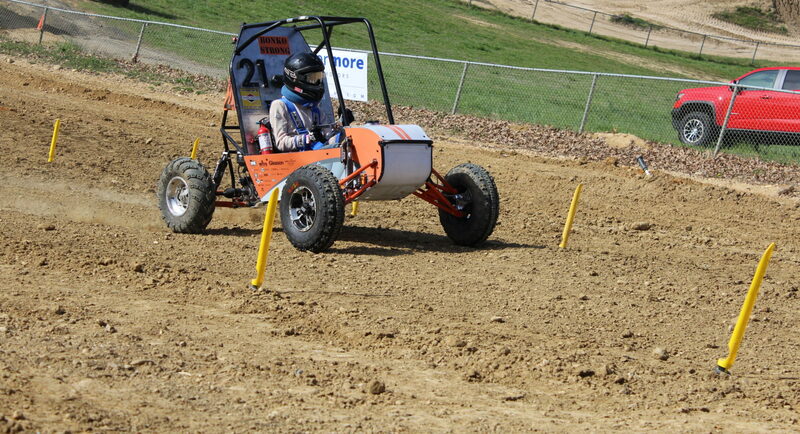 THE CAR IS COMING TOGETHER! Here at the Baja Shop, we’ve been putting in work to make sure our car gets built well and on-time. Before winter break, we managed to make a lot of progress on the frame, but our team really wanted to ensure that we would meet our rolling chassis deadline of February 11th so that we have ample time to test and iterate our designs for this year’s vehicle. To help us meet that goal, Kaven Marte, our Chief Engineer, organized a group of team members to come back to campus before the end of winter break. Over the course of a few days filled with Baja, Baja, and more Baja, they were able to bend tubes and weld together a very large portion of the frame. The weekend after the entire team returned to break, we continued to focus most of our energy on getting the frame manufactured. We have made even more progress, and as it sits now, the frame only has a few minor members left to be welded on. 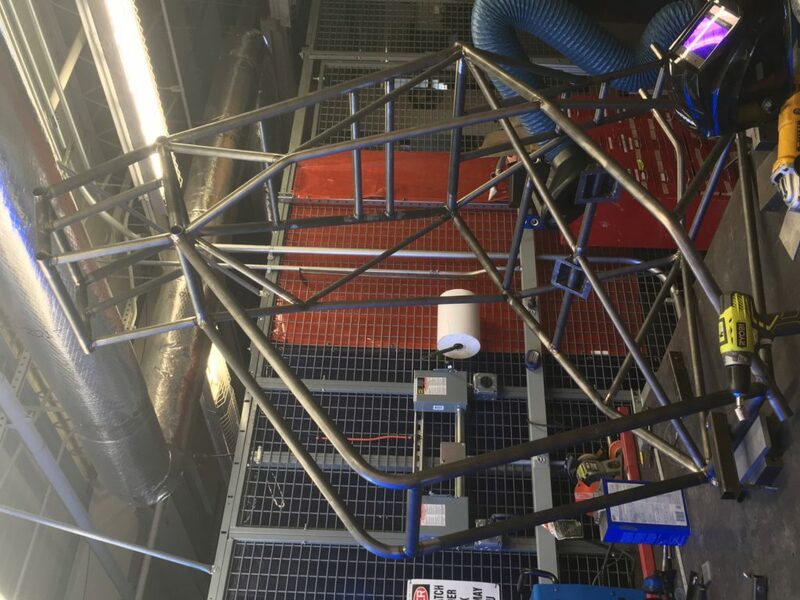 Better still, the last few frame members are all able to be welded on at a later time, so we are now free to continue moving forward with manufacturing and assembling other components of our car. Currently, we are focusing on getting the suspension completed. Noah and his suspension group are following in Gaetan’s footsteps (see Frame section), and are finishing making fixtures to assemble and weld together our suspension components. The fixtures will allow us to lay out the steel and aluminum tubes that we’ll use for the suspension arms in such a way that they cannot move away from the desired positions. Like previous years, we are using a simple A-arm and H-arm geometry where the tubes that make the suspension arms are laid out in a shape that resembles an “A” in the front and an “H” in the back. Hopefully with Noah’s fixtures, we’ll be able to continue to exceed our expectations for tolerances this year. We’ve been working hard to be more precise with our manufacturing this year, and it’s definitely paid off. While the frame and suspension teams have been busy in the shop, our other team members are working in parallel to get other components ready for assembly once our suspension is complete. Several new members have been working on getting tab drawings completed, and we have sent several to Paragon Steel Rule Dies to be cut with a waterjet in the next couple days. Every year, we have to weld about a hundred tabs to our vehicle in order to attach all the different assemblies, and thanks to the support of Paragon, we’ll be able to have these all cut and made in a matter of hours. Also, several of our team members are learning to use the Mechanical Engineering Department’s brand new toy: a HAAS. With the HAAS we will be able to transform our designs into tool paths that the HAAS will use to cut parts to extreme precision. Currently, some people from Noah’s group are working at getting our first few uprights cut so that we’ll be ready to attach wheels to the car as soon as the suspension arms are complete. And everything I’ve discussed so far only covers a small portion of what we’ve been working on. Our team is firing on all cylinders to meet our deadline this year. We have some people working on making a new seat for the car out of carbon fiber, we have people preparing to put strain gauges on the car to understand the loads in our frame, and we have our business group working hard to submit budgeting documentation to the school to secure our funding for next year. It’s a busy time in and around the Baja Shop, but one thing’s for certain, we’re making a lot of progress towards one of the best cars the team has ever built.